Interactive Window Displays, Get Up and Move in the NIU Library! To install the Interactive Window Display, the Digital Convergence Lab applied a rear projection film product by Proscreens to the back of the window glass. The film is designed specifically to display projected images and video. Projectors were mounted inside the windows and connected to a computer where the multimedia and interactive applications are controlled. 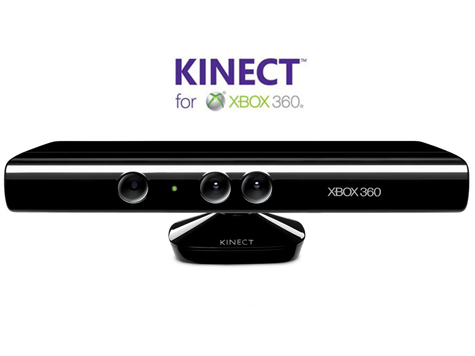 Kinect cameraInteraction is provided through a new technology created by Microsoft Xbox 360 Kinect interfacing with Unity 3D and a web application. 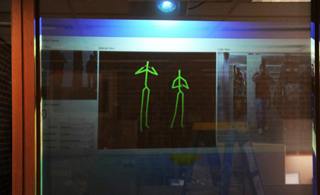 With the Kinect camera, the user controls the display through the movement of his or her body. The interactive window project hopes to engage the NIU Library community in new and exciting ways. Not only does it provide a place for visitors to get up and move, it also serves as a platform for a variety of information such as late-breaking news broadcasts, simulations, and games. It can also be used as a canvas for interactive displays, student artistry and products. Library guests are encouraged to come by the lab and interact with the displays. They are on from 9AM to 10PM Monday through Friday. Contact Aline Click for more information.